Helen Mirren and Richard McCabe in The Audience. Photo by Joan Marcus. BOTTOM LINE: A showcase for Helen Mirren, who transforms herself throughout the play to portray Queen Elizabeth II over a span of 60 years. Early on in The Audience, Helen Mirren changes from a woman in her 60s to a young girl of 25 in front of our eyes, and it looks like magic. Credit goes partly to director Stephen Daldry, who has staged the scene in such a way to distract us, and also to her skilled dressers. Bob Crowley's costumes and Ivana Primorac's wigs certainly age her down. But none of that would work if Mirren weren't totally convincing. Her way of carrying herself and speaking make her instantly younger. She continues to transform herself throughout the play, while creating a consistent portrayal of the woman. Queen Elizabeth II meets with her Prime Minister once a week at Buckingham Palace. There is no record of what is said at those meetings, but Peter Morgan has taken the liberty of imagining. Morgan wrote the screenplay for The Queen, which earned Mirren an Academy Award for playing Queen Elizabeth II. (Hey, if it's not broke, don't fix it.) She also won an Olivier for this role. Because this play is built on speculation, it's impossible to know how much is accurate, but it is easy to adore Mirren's and Morgan's version of the Queen—strong-willed, witty, and compassionate. Even if the conversations are fictional, the play is still a good basic history lesson. There is a handy insert in the Playbill with information about each of her 12 Prime Ministers, from Winston Churchill (Dakin Matthews) to David Cameron (Rufus Wright). It is worth reading before the start of the show, but even without it, it's very easy to follow, no matter your level of familiarity with British government. The scenes are not in chronological order, but the Equerry (Geoffrey Beevers) narrates us through them, sometimes more than necessary. Some Prime Ministers are more known than others, at least in the U.S., and it's the less famous that make the biggest impression, perhaps because we don't have as many preconceived notions about them. Judith Ivey has the unenviable task of portraying Margaret Thatcher, and she comes across as little more than a caricature, though a lot of that is already in the writing. 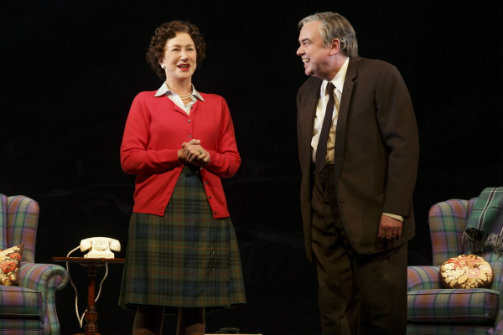 The most moving scenes are between the Queen and Harold Wilson (Richard McCabe, who won an Olivier for this role), who served from 1964 to 1970 and 1974 to 1976. He was her third PM and, according to the play, her best loved, so he becomes a favorite for theatergoers as well. McCabe plays him with warmth and embraces the comedy; it is heartwarming and entertaining to watch their relationship develop over the years. I found myself wanting the play to only be about the two of them. Their scenes sometimes include the appearance of live dogs, the quickest way to delight an audience. Crowley's sets and costumes are visually stunning under Rick Fisher's lighting, particularly during the coronation scene. But with all the beauty and distractions, Mirren is never upstaged. It is her show. She is royalty, after all.